Companies of all sizes are adopting cloud-based services, such as Microsoft Office 365, as a way to give their end-users greater flexibility and easier access to core business applications. This requires corporate IT departments to re-examine their current data security posture such as data loss prevention (DLP) policies to better monitor and control sensitive data that are being created in the cloud, traversing from endpoint devices to cloud applications, and vice versa. 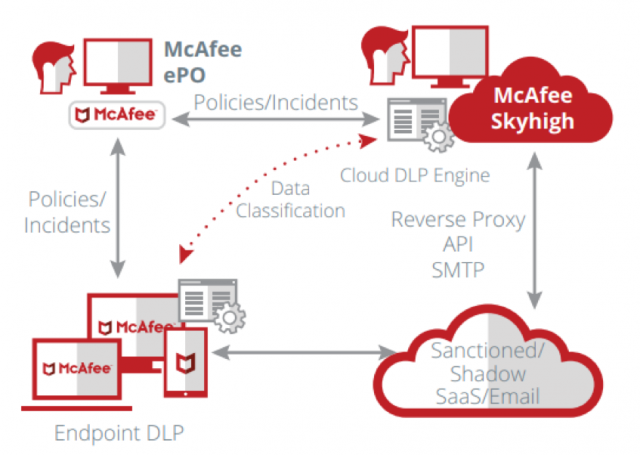 With the latest integration, MVISION Endpoint DLP customers can easily extend existing enterprise DLP policies to the cloud. This is done via the centralized MVISION ePO console by sharing the on-premises DLP classification tags to help define cloud DLP policies. These tags are available out-of-the-box, and there is no requirement to manually touch each policy during conversion/adoption. Connecting the two solutions can be as fast as under one minute. MVISION Endpoint DLP customers can detect classified documents in the cloud with end-user manual classification. On-premises classification tags are shared with MVISION Cloud DLP to control access and prevent data leakage in the cloud. User-empowered classification reduce administrative overhead. A single data protection policy will be created to protect the data, whether it is residing on the endpoint, being shared via the network, or traversing to the cloud applications. This ensures consistent detection on data exfiltration attempts from both managed devices and cloud applications while helping to reduce administrative overhead. It is also highly adaptive because changes made in one console will be reflected in the other one. By leveraging the centralized MVISION ePO console, organizations can benefit from a single pane of glass management experience. DLP violations can be viewed in the MVISION ePO console regardless of whether the incident is from a managed endpoint or a cloud application. With more data being created in and sent to the cloud every day, it is more important than ever to have a set of consistent DLP policies that protects data from any leakage vectors – whether it’s corporate endpoints, unmanaged devices, in the network, or in cloud applications.